Soil-based methods of irrigation scheduling assume that the soil moisture content largely determines the moisture status of the plant. If there is less water in the soil, and the water is held at a greater tension, it will be more difficult for the plant’s roots to take up that water. The result is that the plant will be under greater stress. Thus, irrigation scheduling is done by monitoring and maintaining the soil moisture within acceptable limits that do not adversely affect plant growth. The most basic method of monitoring soil moisture is to take soil samples at various depths (e.g. 1-foot increments) within the root zone. Using a soil auger, sampling tube, or even a shovel requires significant time and effort to sample throughout the root zone. 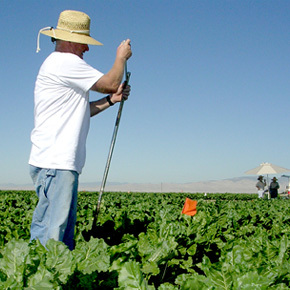 An undisturbed soil samples must be collected, a difficult task if a volumetric soil moisture measurement (e.g. in/ft of soil moisture) is desired. In order to make monitoring of soil moisture easier and quicker than collecting soil samples, a number of soil moisture monitoring tools are available. Some of these tools are described below.